Coevolution between plants and specialist/generalist herbivorous insects has contributed to the evolution of particular defence responses in plants. Specialists and generalists do not elicit the same chemical defences in their host plant. The mechanisms by which this specificity of response is achieved are mainly based on cross talks between three hormone pathways: jasmonic acid, salicylic acid and ethylene. For chewing herbivores, discrimination by the plant of its attacker is driven by differences in composition of attackers' oral secretion. Recent advances in the field do not support the hypothesis of one strategy against specialists and one strategy against generalists. Differential elicitation depends on evolutionary histories and lifestyles of insect and plant species we consider. To overcome their lack of mobility, plants have evolved chemical defensive responses to protect themselves from herbivores . Accumulation of poisons such as glucosinolates  or nicotine  and emission of volatiles organic compounds that attract insects predators  are part of these defence responses. Plants' enemies are numerous and diverse, they can be bacteria, virus, herbivorous mammals or insects, … Herbivorous insects can be divided into generalists and specialists according to their lifestyles. In this review, specialisation is defined by the number of host species: the more plant species an insect eats on, the more generalist it is. Both generalists' and specialists' lifestyles have drawbacks. On one hand, generalists poorly succeed on each host but they are not endangered in case one of them disappears: this is the “Jack of all trades is master of none” principle •. On the other hand, specialists' survival is constrained by the presence of their specific host plant. However, coevolution (Box 1) can occur more easily between a specialist and its host than in the case of a generalist. Coevolution can lead to very adapted insects that succeed more on their specific host compared to generalists •. Specialists can evolve adaptations such as the detoxification or the sequestration of poisons [2,7]. This host-use trade-off may explain the divergence and maintenance of generalist and specialist feeding behaviour in insect herbivores. Plants may have acquired specific mechanisms of protection against specialist and generalist insects: coevolution with specialists can create counter-adaptations in the form of insect-specific defence responses. Coevolution: evolution with retroaction between two species that strongly interact with each other; it may lead to an arms race between species. The more the fitness of each species is altered by the interaction, the stronger the coevolution is. Hormone cross talk: interaction or cross-regulation between several hormonal pathways. Hormone cross talks are thought to play key functions in tuning plant developmental and stress responses by adjusting the amount of specific hormones and downstream signalling. Diet breadth: gradient of specialisation of herbivores according to the number of host species they feed on. Direct defence: defensive responses that directly decrease the fitness of the attacker. Feeding guild: set of species that feed in the same manner. Chewing herbivores represent one feeding guild while phloem-feeders are another one. Indirect defence: defensive responses that use an intermediate to decrease the fitness of attackers: this intermediate can be predators of insects. Different defensive mechanisms against pathogenic species have already been found in plants. For instance, plants specifically respond to microbial (hemi-)biotrophs and to necrotrophs . This is achieved by the recognition of specific elicitors and effectors of pathogens. This recognition leads to the differential activation and interaction of hormonal pathways through cross talks . However, this phenomenon is much less described in plant-insect interactions. One of the reasons is because these interactions are really complex by being influenced by many different factors , and only few studies have been conducted to assess whether plants finely tune their response to the degree of specialism of their attacker. In this review, I will first discuss these results in order to illustrate the diversity of responses activated by the attack of specialist and generalist insects. Secondly, I will review the molecular mechanisms by which this specificity is achieved. Finally, I will conclude by pointing out the studies that do not support the hypothesis of a specific response, and thus, making a synthesis of what the strategy of plants against generalist and specialist herbivores could be. Understanding the general and specific defensive responses of plants would be of outstanding interest to enhance the defence of crops against destructive insects. Several comparative studies have been conducted to assess whether specialist and generalist herbivorous insects elicit different responses in plants (Table 1). These responses have been mainly investigated in two plant families, Brassicaceae and Solanaceae. To be efficient, plants' induced responses have to increase the mortality of insects. For example, the production of trypsine proteinase inhibitors (TPI) and of volatile chemical cues recruiting predators of herbivores has been shown to increase the fitness of plants by decreasing the herbivore load [11,12]. Because we assume that specialists and generalists do not coevolve in the same way with their host, they might induce different kinds of responses. It has been demonstrated that some defensive metabolites act as deterrent for generalist herbivores and at the same time they can act as oviposition and feeding cues for specialist herbivores [13,14]. This can exert an opposed selection pressure on these metabolites . Several studies found that specialists and generalists of the same feeding guild induce different direct defences. Mewis et al. reported that a specialist phloem-feeding aphid (Brevicoryne brassicae) elicits more glucosinolates and camalexin in Arabidopsis thaliana (Brassicaceae) than a generalist aphid (Myzus persicae) ••. As camalexin accumulation was increased compared to the control treatment, the authors concluded that it is a specific response of the plant against the specialist. In the same manner, direct defences of Nicotiana tabacum (Solanaceae) can be differentially induced by specialist and generalist chewing herbivores . In this study, the attack of a specialist caterpillar (Helicoverpa assulta) induced the accumulation of nicotine while the attack of the generalist caterpillar (Helicoverpa armigera) did not influence its basal level. Nicotine's effects on insects have been widely studied and it is known that in nature it is an efficient defence . Zong and Wang also measured the increased activity of defensive enzymes in leaves, such as polyphenol oxidase (PPO) and peroxidase (POD), and observed differential regulation by the attack of the generalist and the specialist . The specialist induced higher levels of POD activity, known to decrease the nutritive quality of leaves, while it decreased the level of PPO, known to be anti-digestive. In Lindera benzoin (Lauraceae) a generalist caterpillar induced more peroxidase activity than the specialist did •. This illustrates that adapted responses against generalists and specialists are highly plant species specific (Table 1). These are evidences to the fact that insects of the same guild, but not with the same diet breadth, can elicit different defences by feeding on the same host. Within plants' cells, hormone pathways are also differentially induced and provide ways to control defensive responses. Most defensive responses are accompanied by costs in case of competition between plants from the same species. For example, constitutively high TPI and hormone signalling levels decrease growth and reproductive fitness of plants [19,20]. Controlling the amount of defensive molecules allows plants to avoid large fitness costs in safe environments, that is why we think that inducibility evolved [19,21]. Three major hormones are involved in this process: jasmonic acid (JA), salicylic acid (SA) and ethylene (ET). Some studies examined the induction of such hormones by generalists and specialists. Diezel et al. measured changes in phytohormone levels in Nicotiana attenuata attacked by a generalist caterpillar (Spodoptera exigua) or a specialist caterpillar (Manduca sexta) ••. The authors demonstrated that the specialist induces bursts of JA and ET while the generalist elicits only SA. Interestingly, the same pattern of induction was found when the main compounds of each caterpillar's saliva were applied onto wounded leaves. This result underscores the role of insect saliva chemistry in tuning the hormone response. Similarly, an older study reported differences between generalists and specialists in the elicitation of hormone levels in N. attenuata . 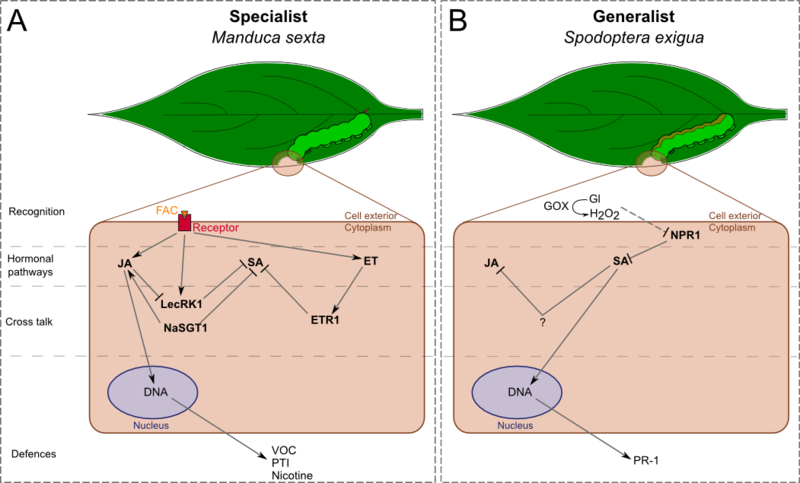 The authors showed that M. sexta induces the production of JA and SA while generalist caterpillars, Trichoplusia ni and S. exigua, particularly induce SA. Another way to correlate attack of herbivores and hormonal pathways is to study the transcriptional responses of plants . In A. thaliana, specialist phloem-feeding aphids increase transcription levels of SA-related genes while generalist increase those of JA-related genes . Likewise, Vogel et al. reported that the transcriptional response induced by the generalist T. ni was well explained by JA and ET elicitation, while SA and ET influenced the specialist response . Still at the transcriptional level, Voelckel and Baldwin demonstrated that the responses induced by two generalist caterpillars are more similar to each other than to the response elicited by the specialist . These differences in the response mechanism may have molecular bases. Thus, in the following, I will discuss the results showing that plants can discriminate at the molecular level their attackers. It is already known that pathogens induce differential responses in plants . In these cases, plants recognize the identity of the pathogen thanks to specific receptors of pathogens molecules (such as flagellin). This leads to the activation and repression of JA, SA and ET. These three hormones interact with each other by cross talks to finely tune the defensive response . The same cross talks have been shown to control the defensive responses against herbivory . Mattiacci et al. reported one of the first evidences that caterpillars' saliva contains elicitors, that is to say molecules that induce a different response compared to mechanical wounding . This elicitor is the β-glucosidase and is present in many caterpillar species. Halitschke et al. showed that applications of other elicitors present in oral secretions of M. sexta, the fatty acid-amino acid conjugates (FACs), are able to induce the same responses as those of M. sexta feeding on a plant . It has been demonstrated that the differences in composition of FACs in saliva are correlated with the pattern of expression of genes that are involved in the defensive responses of plants . Furthermore, a recent study evaluating the diversity of FACs in lepidopteran larvae showed that the composition of FACs can be really different between species: some caterpillars do not have any FACs while others have more linolenic FACs than linoleic FACs •. Thus, plants may be able to recognize these differences in FAC composition to differentially respond to their attackers. To date, only one putative receptor for insect-derived elicitors has been discovered. Truitt et al. reported that a plasma membrane protein could bind volicitin, a FAC from S. exigua's saliva •. It would be of great interest to study the specificity of binding by using other FACs. Insects have also evolved ways to counteract the defensive response of plants. Like in pathogens, some molecules called effectors can beat plants' defences: it is the case for the glucose oxidase (GOX) and its product H2O2 . This enzyme is more abundant in the generalist S. exigua's saliva compared to the specialist M. sexta, which has more FACs ••. This result suggests that generalists have evolved ways to inhibit general defensive response, which is not the case for specialists. However, a recent study found that this same effector can induce defensive responses in tomato •. Application of GOX induced more trichomes and a greater expression level of Pin2 (proteinase inhibitor 2) than wounding alone: tomato might have found the way to counteract the effect of GOX. All these results demonstrate that plants are able to discriminate their attackers thanks to the perception of diverse elicitors. After this perception, hormonal cross talks provide ways to regulate the different hormone pathways, which can in turn affect the different responses of plants . Studying the roles of hormonal cross talks in the specificity of plants' responses to specialists and generalists can help us to explain how hormones and defences are differentially triggered and regulated. In the following, I will review the results of several studies on two models: N. attenuata and A. thaliana. In N. attenuata (Fig. 1), the generalist S. exigua is known to induce production of SA but not of JA (Fig. 1B). Rayapuram and Baldwin demonstrated that when NPR1 (non-expressor of PR1) is silenced SA level increases and antagonizes the JA pathway . This suggests that the function of NPR1 is to negatively regulate the SA pathway during attacks. Therefore, S. exigua might be able to inhibit this function by inducing the release of SA (Fig. 1B). This ability can be linked to the activity of GOX in the saliva of S. exigua: application of GOX and glucose on a wounded leave of tobacco is known to elicit burst of SA and to increase the expression level of PR-1 (pathogenesis-related protein 1), a SA-mediated protein (Fig. 1B) [22,36]. In the M. sexta-N. attenuata system, JA- and ET-pathways are predominantly elicited during attacks (Fig. 1A). Meldau et al. showed that NaSGT1 (salicylic acid glucosyltransferase 1) has a central role in the regulation of JA and SA levels, as well as in the accumulation of SA-dependent PR proteins . NaSGT1-silenced plants are impaired in the production of JA while SA accumulates. This result implies that NaSGT1 can activate the JA pathway and inhibit the SA pathway, but these different activations are independent from each other since both hormones do not seem to act on NaSGT1 (Fig. 1A). Diezel et al. also showed that the ET burst, which is elicited by M. sexta , antagonizes the SA pathway via the ET receptor, ETR1 (ethylene receptor 1, Fig. 1A) ••. However, ET-JA-SA interactions are not always defined by strict antagonisms. For example, LecRK1 (lectin-receptor kinase 1), which function is to suppress the SA pathway, is activated by M. sexta saliva. But JA-dependent COI1 (coronatin-insensitive protein 1) is also activated and repress LecRK1 function (Fig. 1A) . This fact suggests that it is the balance of activation/repression between hormonal pathways that is important to elicit defensive responses. Figure 1. Differential signalling and responses of after the attack of one generalist and one specialist leaf-chewing herbivores. Differential signalling and responses of after the attack of one generalist and one specialist leaf-chewing herbivores. Nicotiana attenuata recognition, elicitation and cross talk between activated phytohormone pathways provide ways to specifically respond to the type of attacker. A) The specialist induces the activation of JA and ET pathways, which interact in different manners with the SA pathway by cross talks. B) On the contrary, the generalist induces the SA pathway that antagonizes the JA pathway. This signalling network leads to the activation of different defences. Dash traits, putative effect. FAC: fatty acid-amino acid conjugate, GOX: glucose oxidase, Gl: glucose, VOC: volatile organic compound, JA: jasmonic acid, SA: salicylic acid, ET: ethylene. In A. thaliana (Fig. 2), S. exigua's oral secretions have been shown to induce SA accumulation. 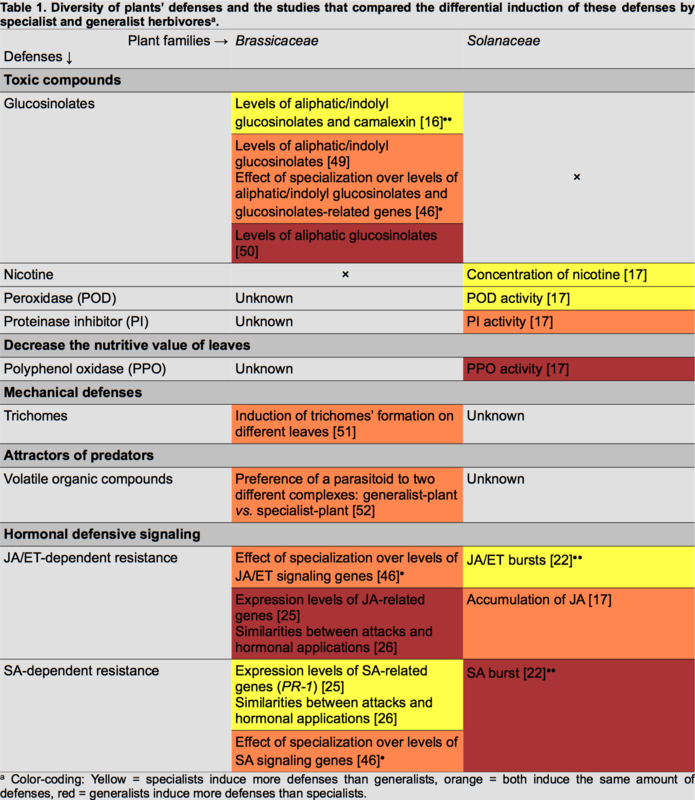 JA-dependent defensive genes and proteins, such as PDF1.2 (plant defensin) and TPI, are not activated in this system . The inhibition of the JA pathway is mediated by the SA pathway. Unlike in N. attenuata, NPR1 enhances SA levels in A. thaliana and likely controls the antagonist effect of SA over the JA pathway (Fig. 2B) . S. exigua's attacks induced the expression of JAZ (jasmonate-zim-domain protein 1), a gene coding for a repressor of MYC2 (a helix-loop-helix transcription factor), which is a transcription factor of the JA pathway (Fig. 2B) . Another generalist, S. littoralis, elicits a different pathway ••. This insect can activate the expression of JA-related genes without inducing the accumulation of JA. It is achieved by the activation, via the Ca2+-signalling, of CPKs (Ca2+-dependent protein kinases), which seem to regulate the transcription of PDF1.2 by phosphorylating HsfB2a (heat stress transcription factor B-2a, Fig. 2B). Figure 2. Differential signalling and responses of after the attack of one generalist and one specialist leaf-chewing herbivores. Arabidopsis thaliana such as N. attenuata, generalists and specialists do not induce the same signalling. Recognition, elicitation and cross-regulation are responsible for different inductions. A) The specialist still induces the JA pathway, but not the ET pathway. It leads to the activation of the MYC2-branch of JA/ET pathway. B) Both generalists do not induce the same responses: S. exigua still elicits the SA pathway and inhibits the JA pathway, while S. littoralis activates an hormone-independent pathway through CPK-Ca2+ signalling. Dash traits, putative effect. OS: oral secretion, GOX: glucose oxidase, Gl: glucose, JA: jasmonic acide, SA: salicylic acid, ET: ethylene. Verhage et al. studied at the molecular level the attack of a specialist herbivore, Pieris rapae . They demonstrated that oral secretions, as well as feeding by P. rapae, only induce the activation of one part of the JA/ET pathways. While MYC2-branch is activated, ERF1-branch (ethylene-responsive transcription factor 1) is repressed (Fig. 2A). Activation of MYC2-branch leads to the transcription of VSP2 (vegetative storage protein 2) but not PDF1.2. They also showed that P. rapae prefers plants that express the ERF1-branch and is deterred by those expressing the other branch. This suggests that A. thaliana have found a way to prevent P. rapae from attacking by differentially activating the JA pathway. This may be achieved by the inhibition of an ET burst (Fig. 2A). In fact, another study showed that ERF1 is activated by ET and can repress MYC2-branch . We have here an example of a cross talk between the JA and ET pathways that allows the plant to tune its response to its attacker. It would be of great interest to see whether P. rapae induces or not an ET burst while it is feeding. Two other molecules are implied in cross talks between ET and other hormonal pathways. ET and JA can activate HAHB4 (homeodomain-leucine zipper transcription factor), a protein that induces JA synthesis, JA-dependent defences and represses both SA and ET pathways . It seems that this molecule plays a pivotal role in making the phytohormonal balance during attacks. But, to my knowledge, no study has linked HAHB4 level to insects' attacks. Its role in tuning the response of plants against both generalists and specialists remains elusive. NPR1 has a dual role: it can activate SA-related genes and suppress the JA pathway ••. ET has a key role in regulating these two functions: it promotes the transcription activation of PR-1 by NPR1 while it suppresses the inhibitory function of NPR1 on the JA pathway. Thus, ET activates both hormonal pathways by preventing SA from directly repressing JA-related defences. It adds another layer of complexity as SA can also antagonize the JA pathway in a NPR1-independent manner ••. In this review, I discussed the ability of plants to specifically respond to their herbivores. Several studies have suggested that this specificity is based on the specialisation of herbivores [16,17,22,27]. However, some studies showed that this specificity of response is not a general rule, as they often found no differences in the transcriptomic patterns induced by both specialist and generalist [24,46,47]. Furthermore, it is also assumed that the different feeding guilds (phloem-feeders vs. chewing herbivores) are mostly responsible for the differences seen in defensive responses [46,48]. Maybe studying solely transcriptomic levels is not sufficient to unravel the subtle differences in specialist- vs. generalist-induced responses. It would be of great interest to use integrative approaches where transcriptome and metabolites analyses are coupled with feeding bioassays. Future studies should also compare the effect of specialisation over a large set of defences. Limiting oneself to one type of defence would lead to think that there is no specific response while another defensive response is involved. Experimental conditions may also strongly influence the defensive responses of plants: Mewis et al. demonstrated that water stress modifies the accumulation of secondary metabolites in plants •• (see also • for effects of sun and shade). In their recent review, Ali and Agrawal raised another weakness of most studies that compared defences against specialists and generalists: they did not use enough species to differentiate the specialisation effect from the species effect ••. Furthermore, it would be more relevant to study specialisation between two close-related species in order to minimize the number of differences between these species. I would also suggest properly choosing the plant according to the goal of the study. Several and diverse plants should be used to assess whether differential responses are spread among plants. However, studying the specific mechanisms of differential responses implies the use of plant models with sufficient genetic resources such as A. thaliana, N. attenuata or tomato. The study of specific responses leads us to one major question: does a common strategy against herbivores with the same diet breadth exist? The different results here do not support this hypothesis. Depending on the plant and on the insect, the defences and the triggered mechanisms are not always the same. One generalist does not induce the same response than another (Fig. 1,2). Sometimes, generalists trigger a greater accumulation of poisons than specialists do. Sometimes, it is the contrary (Table 1). This fact leads us to two conclusions: responses also depend on the evolutionary history of each herbivore with each plant, and we may have to revisit the definition of specialist and generalist lifestyles (reviewed by Barret and Heil •). We must not define a specialist just by the fact that it is monophagous. We have to include other characteristics: does it feed only on one family of plant? On one part of the plant? Etc . Furthermore, every insect may not coevolve in the same manner with every plant. It depends on the defensive strategies of each protagonist. For example, it would be advantageous for specialists that sequester poisons to induce their production by the plant when they feed on. On the contrary, it might be better for specialists that do not sequester secondary metabolites to avoid toxins accumulation. Thus, it raises another issue in plant-insect interactions: do these differential responses come from a plant strategy or an insect strategy? Both cases have been documented and they imply that defensive responses are not only driven by recognition and fine-tuning by plants ••. I want to thank Dr. Laurent Balvay and Dr. Emmanuel Gaquerel for their helpful advices, Dr. Ana López Llandres, Marion Bossennec, Mathilde Calvez, Timothée Fouqueray, Morgan Jeannin and two anonymous reviewers for their valuable comments on the manuscript. 1. Walling LL: The myriad plant responses to herbivores . Journal of Plant Growth Regulation 2000, 19 :195–216. A comprehensive review that highlights the misunderstanding of the multidimensional aspect of specialisation. The authors demonstrated that a specialist is more tolerant to toxic compounds of its host plant than any other noctuid species. It is a great example of coevolution between a specialist and its host. 11. Zavala JA, Baldwin IT: Fitness benefits of trypsin proteinase inhibitor expression in Nicotiana attenuata are greater than their costs when plants are attacked. BMC ecology 2004, 4 :11. 15. Lankau RA: Specialist and generalist herbivores exert opposing selection on a chemical defense . New phytologist 2007, 175 :176–184. The authors evaluated the effect of both specialisation and experimental conditions on the induction of secondary metabolites. They highlighted the adaptation of the host plant against the specialist aphid. Another example of the effects of specialisation and condition on the induction of defensive responses. 19. Zavala JA, Patankar AG, Gase K, Baldwin IT: Constitutive and inducible trypsin proteinase inhibitor production incurs large fitness costs in Nicotiana attenuata . Proceedings of the National Academy of Sciences of the United States of America 2004, 101 :1607–1612. 21. Heil M, Baldwin IT: Fitness costs of induced resistance: emerging experimental support for a slippery concept . Trends in plant science 2002, 7 :61–67. The authors demonstrated that in N. attenuata, the induction of hormonal signallings depends on the saliva chemistry of herbivores. 23. Heidel AJ, Baldwin IT: Microarray analysis of salicylic acid-and jasmonic acid-signalling in responses of Nicotiana attenuata to attack by insects from multiple feeding guilds . Plant, Cell & Environment 2004, 27 :1362–1373. 29. Mattiacci L, Dicke M, Posthumus MA: beta-Glucosidase: an elicitor of herbivore-induced plant odor that attracts host-searching parasitic wasps . Proceedings of the National Academy of Sciences 1995, 92 :2036–2040. 30. Halitschke R, Schittko U, Pohnert G, Boland W, Baldwin IT: Molecular interactions between the specialist herbivore Manduca sexta (Lepidoptera, Sphingidae) and its natural host Nicotiana attenuata. III. Fatty acid-amino acid conjugates in herbivore oral secretions are necessary and sufficient for herbivore-specific plant responses . Plant Physiology 2001, 125 :711–717. The authors showed that the compositions of FACs differ in many lepidopteran species. It may account for the recognition of attackers by plants. First report of a putative receptor for a herbivore elicitor, which is a FAC. The authors reported a case of counter-adaptation of tomato against a herbivore's effector known to beat plants' defences. 41. Kanchiswamy CN, Takahashi H, Quadro S, Maffei ME, Bossi S, Bertea C, Zebelo SA, Muroi A, Ishihama N, Yoshioka H: Regulation of Arabidopsis defense responses against Spodoptera littoralis by CPK-mediated calcium signaling . BMC plant biology 2010, 10 :97. Triggering of plant's defences is not only driven by hormonal induction. The authors showed that a generalist herbivore elicited defences in a hormone-independent way. The authors reported a great example of a protein involved in the cross talk between the ET, JA and SA pathways. A recent study, which conjugates transcriptome and metabolites analyses, showing that induction of plants' defences according to the specialisation of the attacker is not a general rule. An interesting review of two ecological models that explain the differential induction of defences in plants by herbivores. The authors provide some advices to conduct a comparative study of the elicitation of defences by specialists and generalists.